Philips 15W, Sterilamp® T8 UV Lamp, Medium Bi-pin Base. Germicidal UV-C lamp for air and water disinfection applications. Compatible with Ionic Breeze air purifier. 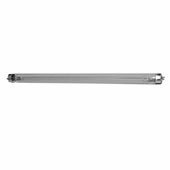 UV Lamp Model: IONIC BREEZE GT UV BULB/LAMP G15T8 TUV15T8 UV Lamp Length: 18" Effective Lamp Life: 8,000 hours Lamp Base: Medium bi-pin Lamp Diameter: 1"